Almost every city has its icon building or skyscraper making it the symbol of the city if not the entire country. 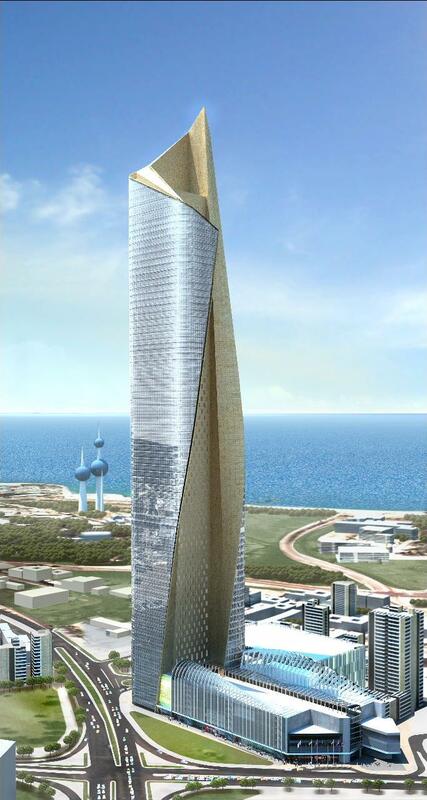 Kuwait has its “Kuwait Towers” but now this might change, a new iconic tower is emerging. Like everything so big, controversy arises, many people are against it due to the high cost and its “alien” character in a city where no proper city planning has been done, others however are thrilled to have such a monument that would draw international attention. The AlHamra tower is 412m high, one of the 10 highest towers in the world, however this is not the main special characteristic of this tower, its pride resides in it being the tallest “sculpted” tower. It is about time we appreciate design and form over just height. This tower captures it all. Its southern wall acts as the backbone of the skyscraper, yet it is designed to decrease solar radiation. In a country as hot as Kuwait, creating such an aspect that protects the building against harsh environmental conditions is essential. It’s a pity how the area around it is very primitive with old 1 and 2 story structures that are an eyesore for everyone passing through the city. In addition to the unfortunate surrounding, the angle at which the tower is situated does not allow much ability for passers by to view the entire monument, it can only be seen fully from a distant angle. Instead of criticizing the AlHamra tower for being among these buildings, instead, I think its a step to find a solution for everything that should NOT be there. Below are images taken from AlHamra website, the video from Discovery’s “Build it Bigger” , and the last one from my phone’s camera couple of days ago to show the tower’s recent status. For details, floor plans, and images please refer to the tower’s web site. A different and very famous skyscraper stretches horizontally as much as the height of the Empire State Building located in Shenzhen, China.The uniqueness of it is its floating impression with a 35m height limit above a very large green space which is open to the public. This skyscraper of the head office for Vanke Co. ltd,with office spaces, apartments, and a hotel. Manhattan’s skyline is at risk of change after the approval was granted recently for the new 67-story skyscraper that will be built in the shadow of the Empire State Building. For years the Empire state building was according to surveys “America’s most loved structure”, and now with the attempt to build such a high skyscraper so close to it has cause a local stir. Probably if it were built anywhere else, we wouldn’t have seen so many objections. Those who voted for it however indicated the increase of jobs and transportation solutions it will provide.